Kansas City, then Lees Summit, MO. Publisher: Unity Tract Society / Unity School of Christianity. Editor: Charles Fillmore (1854-1948), Myrtle Page Fillmore ( -1931). Corporate author: Society of Silent Help / Society of Silent Unity / Unity School of Christianity1/1, June 1891-current. This is one of the fundamentally important New Thought journals. It was originally published June-December, 1891 as a cheaper companion to Modern Thought, devoted to Silent Unity. It was then discontinued until re-started in 1895 to absorb Modern Thought and its successors, assuming the latter journal's volume numbering. This is the longest-lived New Thought journal. J.W. Teener's dissertation on "The Unity School of Christianity" (University of Chicago, 1939) says that it reached a circulation of 148,000 by 1928, and then fell steadily thereafter. The winged globe that appeared on the cover of the journal from the first issue was taken by Charles Fillmore from F.B. Dowd's Temple of the Rosy Cross (1882; 2d ed. 1888). The journal was strongly Christian and Biblical in its presentation but rested on the fundamental propositions that God is good and within each of us and desires to assist if asked. The journal regularly carried page-sized notices in bold colors with aspirations, inspiring thoughts, suggestions to the inner self, and the like, to be placed prominently about the home. Although the journal had contributions by Horatio W. Dresser, H. Emilie Cady, Annie Rix Militz, Walter de Voe, and others, it was largely written by Fillmore and the graduates and ordained ministers of Unity. In his later years, in connection with his views on the role of sexuality in spiritual and psychical development (the "regenerate life"), Fillmore came to espouse the idea of physical immortality. The journal advertised extensively for Fillmore's books, pamphlets and courses, but managed to avoid the commercialism that affected most contemporary journals. For Fillmore and his ideas, see the note under Modern Thought. See also the notes under Weekly Unity, Wee Wisdom, Daily Word. NYPL; Unity School of Christianity; Kansas City Public Library. Devoted to the Spiritualization of Humanity from an Independent Viewpoint. 1/1, April 1889-March 1890. For postal reasons, the journal's subscription was set at $1.00, but copies were mailed free to all who were interested. The first issue proclaimed its intent to mail 10,000 copies of the second number. This was the beginning of Unity (The Unity School of Practical Christianity / Unity School of Christianity), which has endured until the present. It was founded by Charles Fillmore (1854-1948) and his wife, Myrtle Page Fillmore ( -1931). The Fillmores were adherents of the optimistic, energetic school of New Thought, but in their beginnings were closer to the "metaphysical healing" ideas of Christian Science although they were never students or adherents of Mary Baker Eddy. Their initiation into New Thought came through Emma Curtis Hopkins' Christian Science Theological Seminary in Chicago. Horatio Dresser, in his history of New Thought, lists the Fillmores, along with Eddy, among the "subjective idealists" who taught that the mind was the only reality. The journal in its early days, like many of its contemporaries, displayed the influence of spiritualism. 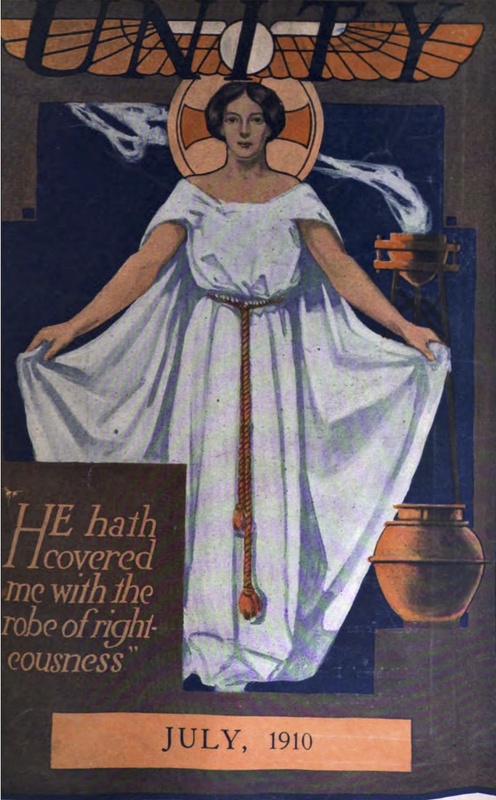 Theosophy, and occultism--featuring in its first year an article by Freeman B. Dowd, and adopting for its masthead Dowd's (and P.B. Randolph's) emblem of the winged globe. The issue also carried Hiram Erastus Butler's article on "Developing Psychic Powers." It is often said that W.W. Atkinson published his first work in the journal but the claim is wrong. The Unity School of Christianity published Christian Science Thought-->Thought-->Unity; Wee Wisdom; Weekly Unity; Christian Business Man-->Business Man-->Good Business-->New; Youth-->Progress-->You-->Progress; Daily Word; and Unity School Leaflets. The Fillmores' work and journals were astonishingly influential, and many of their enterprises (publishing and book distribution, Unity Farm, Unity School, the Unity Farm, etc.) endure today. Unity Library and Archive, Unity Village, MO.